Brief Description: Graham Inward was only three years old when war broke out in September 1939, but many of his memories of living through the war years in his family home in Harringay, North London, and as an evacuee on four separate occasions remain to this day incredibly vivid, from bombing raids and destruction to childhood games and camaraderie. The discovery, following his father’s death, of 36 letters, most between himself and his father during his evacuation periods, has not only sparked very personal, isolated and interesting recollections of living through the Second World War as a child, but has also led to personal discoveries about his relationship with his father that he will always treasure. experience to those of us fortunate enough not to have lived through those terrifying years. 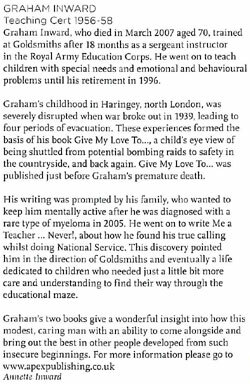 About the Author: Graham Inward was born in June 1936 and was living in North London at the time of the outbreak of the Second World War. His childhood through the war years was thus spent both in blitzed London and also as an evacuee on four separate occasions. Following National Service in the Royal Army Educational Corps, he spent 38 years in the teaching profession, largely working with children with special educational needs. In 1961 he married his wife Annette and they have four children and four grandchildren. This is a charmingly innocent and yet deceptively potent little book from a fairly rare perspective – a very young boy. The author’s paradoxical life at Alton and London comes through very evocatively – it is a moving read. The photographs, letters, reports and references are very useful for history lessons. It’s great to see how memories and experiences endure and you feel strong admiration for this incredible generation. Anyone who has lived through the last war, of whatever age, will have memories that will stay with them forever, and according to the circumstances and horror of the event some of those memories will be so intense and disturbing they will never be forgotten and only recalled with much emotional difficulty. I was a young teenager during the war. My parents were in London, where my Father was a Doctor in general practice, and I was with them for a time before I left for Glasgow to begin an engineering apprenticeship. I experienced at different times the London blitz, the Clydeside blitz and latterly the whole of the VI and V2 rocket attacks, which for some, especially those who survived the whole of the London blitz, were the worst and most unsettling period of aerial bombardment of defenceless citizens, so I have personal experience of a great deal of what the author is writing about. 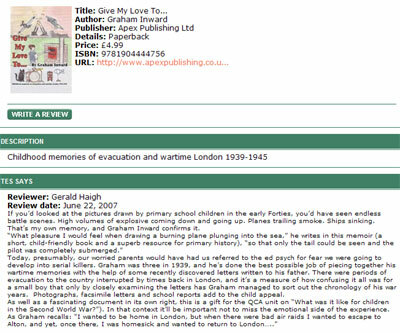 This modest and delightful little book recaptures some of the emotional responses of a very young boy who lived through the whole period of the last war, sometimes as an evacuee, and some of the time in London. It is a time no one will forget if they are old enough, and I think it is valuable that today’s generation, brought up in the welfare state and with so much potential luxury available should know what their parents and grandparents went through in order for them to enjoy the quality of life that most people can experience today. This moving account of one small boy’s experiences during those years between 1939 and 1945 is a valuable addition to the collective memory of a nation. A really interesting read, it brought back so many memories. What an interesting concept this book is! It might be snall in thickness, but it is full in information. Those of us who were not old enough to experience the evacuations, the fear - the leaving behind of a precious family pet - all these things were brought to mind as I read the words of Graham Inward. How wonderful that he not only kept a diary, but lent his toys, etc, to a museum to educate others. What a legacy he has left his father by teaching special needs children! This is an incredibly interesting piece of literature which shares English history in the finest. Just before she died, my paternal grandmother gave my wife a copy of an old Be-Ro cookery book published during World War II. Even now I look through it from time-to-time, trying to imagine what life must have been like during those dark, dark days of rationing and doodle-bugs. 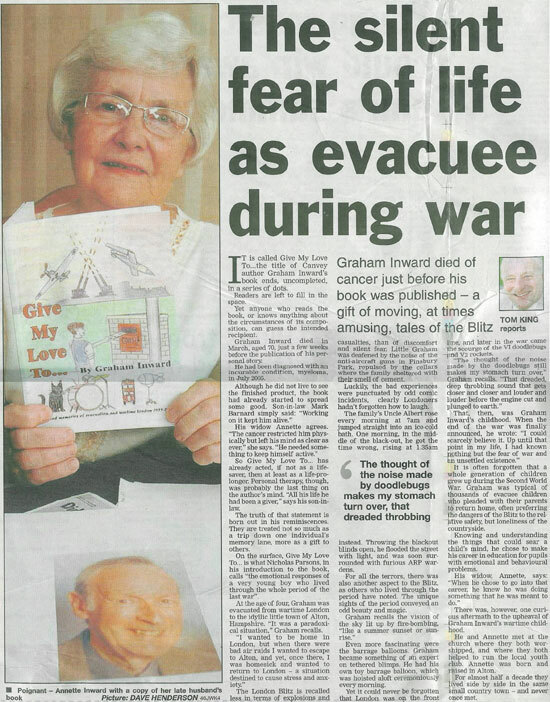 Graham Inward has produced a delightful – and extremely moving – account of wartime evacuation. Lavishly illustrated, Inward catches perfectly the atmosphere of the times. Every child in Britain should be made to read this book; then they might realise just how lucky they are. I can think of no greater compliment than to say that my grandmother would have loved this book – and I’m sure shed a tear as old memories came to life. If you’d looked at the pictures drawn by primary school children in the early Forties, you’d have seen endless battle scenes. High volumes of explosive coming down and going up. Planes trailing smoke. Ships sinking. That’s my own memory, and Graham Inward confirms it. Today, presumably, our worried parents would have had us referred to the ed psych for fear we were going to develop into serial killers. 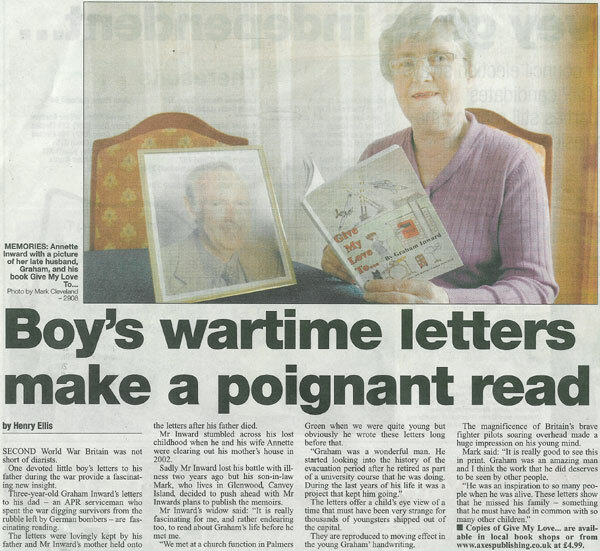 Graham was three in 1939, and he’s done the best possible job of piecing together his wartime memories with the help of some recently discovered letters written to his father. 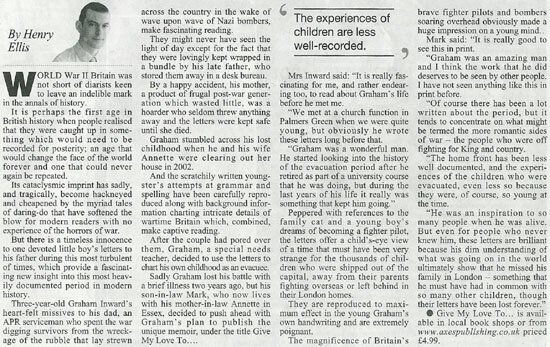 There were periods of evacuation to the country interrupted by times back in London, and it’s a measure of how confusing it all was for a small boy that only by closely examining the letters has Graham managed to sort out the chronology of his war years. Photographs, facsimile letters and school reports add to the child appeal. Hornsey Historical Society (http://www.hornseyhistorical.org.uk) has always encouraged people to record their memories of past times. It has for example, made audio recordings at its oral history group meetings, and also published books, and articles in its annual Bulletin based on reminiscences. 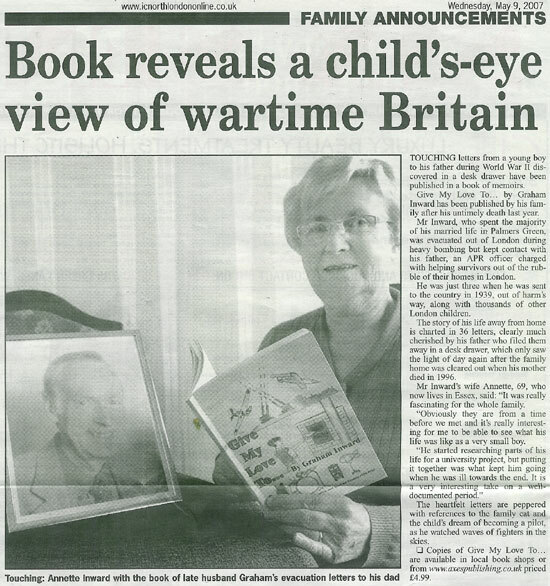 Its booklet HOME FIRES - A North London Suburb at War has sold steadily since its publication in 1992. So the society was very pleased to provide archive photographic help to Graham Inward when he decided to record his own unique experiences of war time yrars, covering both evacuation (all Hornsey schools wee evacuated to Wisbech in the first instant, though Graham was mainly to stay with relatives in Hampshire) and also those dreadful bombing days which (like myself) he suffered. Usefully the book of about 50 pages also includes at the end some 50 black and white photographs. The society was able to provide a map showing the 85 bomb incidents in World War II near Harringay, the author’s home area. 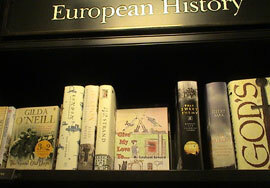 It also shows photos of items loaned by the author to the 1996 Evacuation exhibition at the Imperial War Museum. 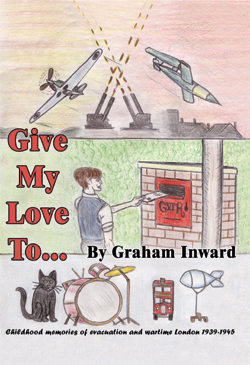 Give My Love To… By Graham Inward, and available from Apex Publishing, is a charming book following the childhood memories of evacuation and wartime London 1939-1945. 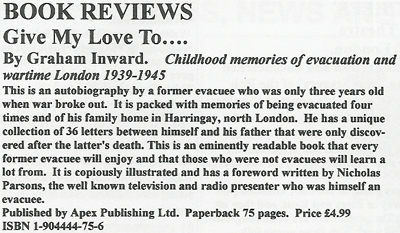 Graham Inward was only three years old when war broke out in September 1939 but evacuation from his home in Harringay, London was something that began almost immediately. 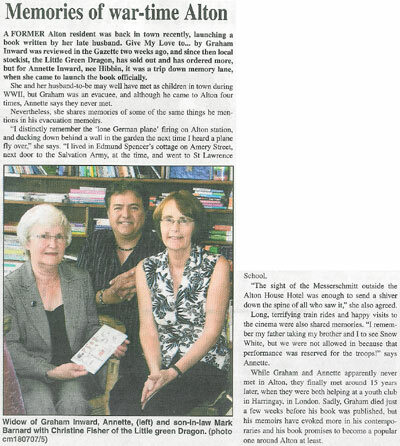 His memories are extremely vivid and the accounts that he has have been aided by the discovery of his late father’s private papers, including 36 letters and Inwards school reports. 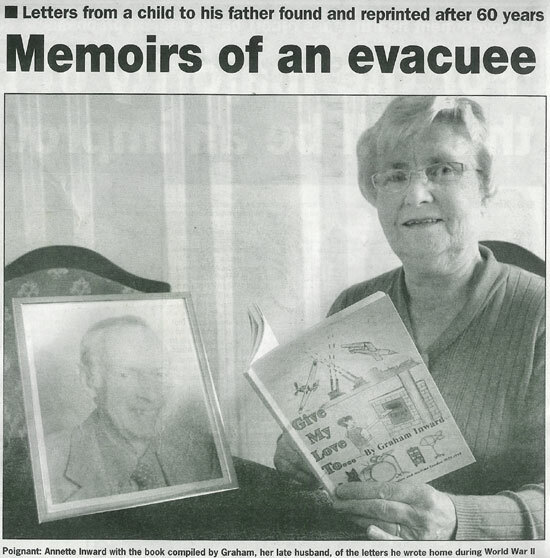 During the evacuation Graham Inward stayed in Wisbech, Cambridge, Thorn Cottage and YWCA in Alton and on a number of occasions was unaccompanied by his mother. The whole experience was particularly unnerving and created an immense sense of insecurity. This little book is super and contains photographs, letters drawings and school reports. Additionally Graham Inward has been contacted by The Imperial War Museum as all of the artifacts he has used to compile the book can quite easily be used for teaching purposes in the educational department of the museum. 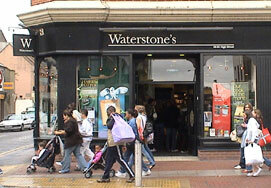 'Give My Love To...' on sale at Waterstone's, Southend on Sea (High Street).